Ensuring that children have a healthy diet is a basic responsibility of parenting. However, the high rate of obesity among US children suggests that many parents may be struggling in this area. In October 2016, the C.S. 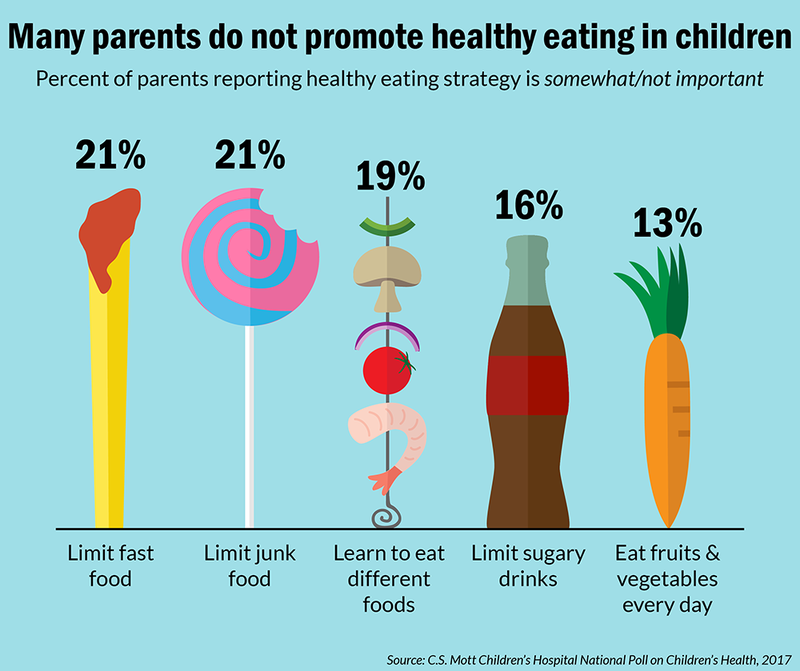 Mott Children’s Hospital National Poll on Children’s Health asked a national sample of parents about their strategies and challenges related to providing a healthy diet for their children age 4-18 years. Nearly all parents (97%) agree that eating habits during childhood will have a lifelong impact on their child’s health. However, only 17% rate their own children’s diet as very healthy. In contrast, the majority of parents (56%) rate their children’s diet as mostly healthy, while 27% say somewhat or not healthy. Only one-third of parents (34%) are confident that they are doing a good job shaping their child’s eating habits. Parents report a number of challenges in getting their children to eat a healthy diet. Common challenges are that healthy food costs too much (70%), that children do not like healthy food (60%), and that healthy food is not convenient (52%). Nearly half of parents (48%) find it hard to tell which foods are really healthy; this challenge is more prominent among parents with lower education and income levels. Nearly one in four parents (23%) say that healthy food is not available where they shop; this challenge is also more prominent among parents with lower education and income levels. Most parents recognize the importance of known strategies to promote a healthy diet for their children. However, about 1 in 5 parents say it is somewhat/not important to limit junk food, to limit fast food, and to have children learn to eat different foods. Sixteen percent believe it is somewhat/not important to limit sugary drinks, while 13% say it is somewhat/not important that their child eats fruits and vegetables every day. In general, parents of teens place less importance on these strategies, compared to parents of younger children. 1 in 5 parents don’t think it is important to limit junk food and fast food in their child’s diet. Parents’ biggest challenges around healthy eating include cost, convenience, and children’s food preferences. Nearly all parents believe childhood eating habits have a lifelong impact on health, but only 1 in 6 parents say their child’s diet is very healthy. This latest Mott Poll confirms that most parents recognize the importance of establishing good eating habits during childhood, but face a variety of day-to-day challenges in providing a healthy diet for their children. The impact of these challenges is seen in the finding that only 1 in 6 parents rate their child’s diet as very healthy. The two most common challenges for parents in this poll are the cost of healthy foods, and children not liking healthy foods. These issues go hand in hand. Groceries are a major household expense, and parents on a tight budget have to give careful consideration to food purchases that will increase their grocery costs, such as fresh fruits and vegetables. Frustration ensues when parents spend additional dollars to buy healthy foods, only to have children refuse to eat them. The tension between buying foods children like, and buying foods that are healthy, is an everyday struggle for many families. Convenience is another major consideration that impacts parents’ approach toward healthy eating. Whether due to parent work schedules or children’s activities, many families feel stressed for time, particularly around meal preparation. Many convenience foods are high in sugar, fat and calories, and findings from this Mott Poll highlight parents’ challenges in preparing meals that are both healthy and convenient. However, these results also show that 1 in 5 parents do not acknowledge the importance of limiting fast food and junk food in their child’s diet. This is concerning, as overconsumption of fast food can cause childhood obesity and other health problems. Nearly half of parents in this Mott Poll admit that it is difficult to tell which foods are really healthy. This is a critical problem that has many causes. Food labels and advertisements use a variety of terms intended to convey that a product is healthy, such as all-natural, low-fat, organic, and sugar-free. These terms are not well-defined and are used inconsistently, which can be confusing to parents who are trying to compare the relative healthiness of different products. Another factor contributing to parents’ challenges with identifying healthy foods for their children is that nutrition science has yielded conflicting results about food-related health risks and benefits. Moreover, nutrition recommendations from key governmental agencies have changed over time, and parents—particularly those at lower income and education levels—may not have the most up-to-date information. Parents with very young children may receive nutrition guidance through their child’s health care provider or the WIC program, but as children get older, there may be fewer opportunities to reach parents with nutrition information. Parents at lower income and education levels also report more challenges with availability of healthy foods where they usually buy groceries. For example, families without reliable transportation to a well-stocked grocery store may rely on convenience stores for many of their food purchases. There is a large discrepancy between grocery stores and convenience stores in the variety of fresh, frozen and packaged food options – and limited options likely translates to greater challenges in finding and purchasing healthy foods. A number of child health groups offer information for parents around child nutrition. All parents should learn which food groups to emphasize (e.g., fruits and vegetables) and which foods to limit (e.g., fast food, sugary beverages). Many parents also would benefit from practical suggestions on how to convince children to try unfamiliar foods as well as strategies to make healthy eating convenient. This report presents findings from a nationally representative household survey conducted exclusively by GfK Custom Research, LLC (GfK), for C.S. Mott Children’s Hospital. The survey was administered in October 2016 to a randomly selected, stratified group of parents age 18 and older (n=2,036). Adults were selected from GfK’s web-enabled KnowledgePanel® that closely resembles the U.S. population. The sample was subsequently weighted to reflect population figures from the Census Bureau. The survey completion rate was 60% among panel members contacted to participate. This report is based on responses from 1,767 parents who had at least one child age 4-18 years. The margin of error is ± 1 to 3 percentage points. Clark SJ, Gebremariam A, Singer DC, Kauffman AD, Schultz SL, Freed GL. Healthy eating for children: Parents not following the recipe. C.S. Mott Children's Hospital National Poll on Children's Health, University of Michigan. Vol 28, Issue 4, February 2017. Available at: http://mottpoll.org/reports-surveys/healthy-eating-children-parents-not-following-recipe.